Alpha 50, the most compact of the Focal Alpha line, is perfectly adapted for confined spaces. The ALPHA 50 is composed of a 5” (13cm) woofer/ midrange speaker with a Polyglass cone loaded in a large laminar port and of a 1" (25mm) aluminum inverted dome tweeter. It features a 20W amplifier for the tweeter and a 35W amplifier for the woofer, and has a frequency response of 45Hz to 22kHz (+/- 3dB). Focal's Alpha 50 is ideally suited to use in areas with restricted space, it's the most compact of the Alpha line. The Alpha 50 is made of a 5” woofer / midrange speaker with a Polyglass cone loaded in a large laminar port and of a 1" aluminium inverted dome tweeter. It provides a 20W amplifier for the tweeter and a 35W amplifier for the woofer, and has a frequency response of 45Hz to 22kHz (+/- 3dB). Focal’s Alpha studio monitors guarantee optimum integration as a result of their exclusive technologies and expertise in speaker drivers and their mechanical design. Environments for music production are invariably diverse, not optimised acoustically, or have only been done so insufficiently, and their listening distances differ greatly. Alpha studio monitors are the perfect solution for confined spaces, locations with poor acoustic qualities or for styles of music which require neutrality, dynamics and high SPL. From the first stages of R&D, the Alpha line was constructed to resolve these problems while focusing on one specific goal: upgrading the quality of music production by affording the user improved control over the audio spectrum. A feature for which Focal has gained notoriety is the inverted-dome tweeter - it's a key factor in the magic internals behind the Alpha 50’s outstanding performance. The specific advantage of the inverted dome is that it augments the mechanical coupling between the voice coil and the dome. Because the voice coil is fixed at mid-height on the dome, it’s capable of evenly moving the Alpha 50’s entire cone surface. This design delivers innate high efficiency, accuracy, and energy, all resulting in a tremendously detailed soundstage. Of course, the Alpha 50 capitalises on that to full effect by employing an aluminium/magnesium alloy for the tweeter material. 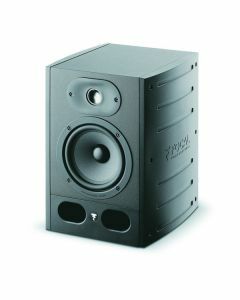 This is reflected in the choice of technologies used, such as the inverted dome tweeter, that provide a very linear treble, reveal the slightest imperfections of equalisation even from a short distance away and also prevent auditory fatigue ; the Polyglass cone woofer, which gives excellent damping qualities, ensuring flawless neutrality over the entire bass/highâ€‘midrange frequency spectrum, and a remarkable transparency to the midrange frequencies ; and the unique bassâ€‘reflex design with large double front ports, which improves acoustical integration even in confined spaces nor installed near a front wall. Finally each Alpha studio monitor is equipped with two class AB amplifiers. The highâ€‘current amplifiers enable complete control of the dynamics of the audio signal. This also allows for listening at high volumes without distortion.